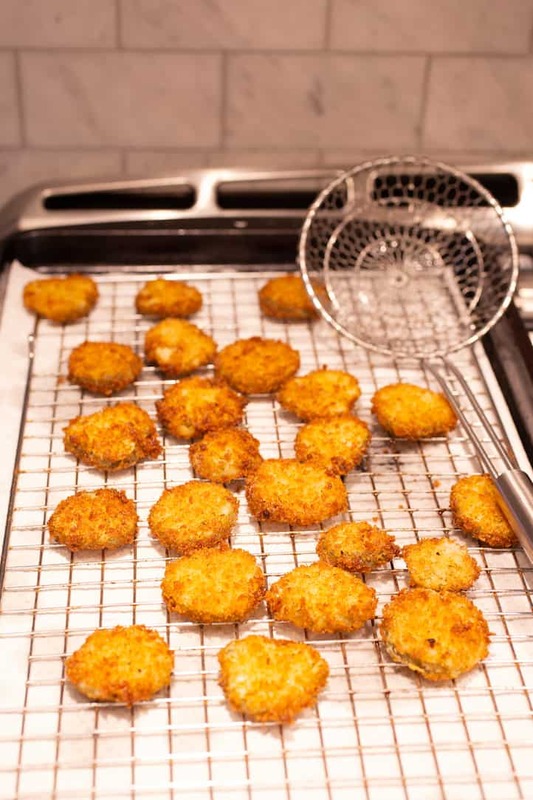 Deep Frying 101: How to Deep Fry on the Stovetop | Good. Food. Stories. If I had a dime for every time I heard the question-slash-complaint, “Oh, you have to deep fry that recipe? I don’t have a deep fryer!”, I’d be swimming around in my Scrooge McDuck pile of coins right now. Believe me when I say that working with boiling oil isn’t the medieval torture so many home cooks consider it to be. Like rolling out pie dough and shucking oysters, it’s a technique that becomes less nerve-wracking with practice and the right equipment. Much like a multicooker or slow cooker, an electric deep fryer is designed to take all of the guesswork out of the process of deep frying. Its digital temperature panel maintains the oil at a consistent temperature, a fry basket allows for splash-free dunking and removal of your ingredients, and automatic oil filtration helps clean up and store your oil when you’re done. But you absolutely don’t need an electric deep fryer to successfully crisp up a soft shell crab, serve homemade fried pickles, or flash-fry a quick batch of potato chips. Nor do you have to resort to air frying, which can be tasty in its own right, but not a true substitute. 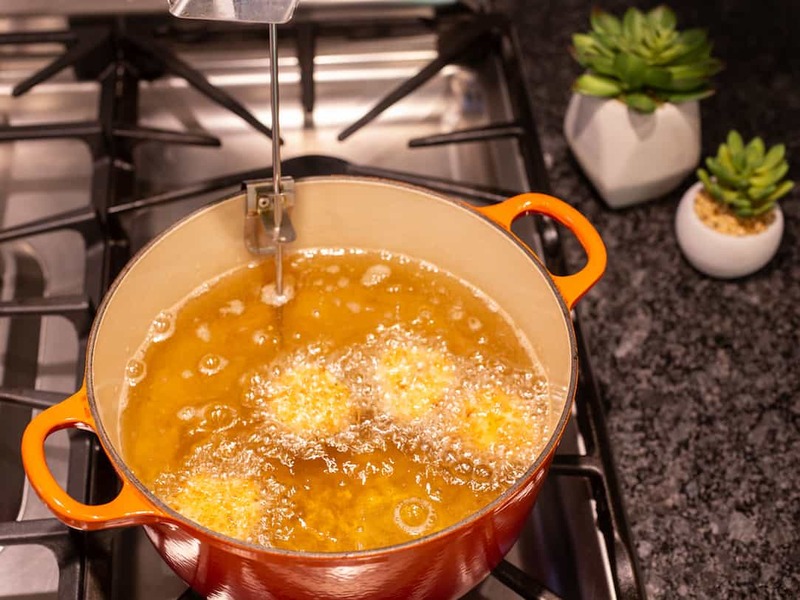 You most definitely can deep fry on your stovetop without fear or worry! Here’s Deep Frying 101 for when you’re ready to take the plunge. Watch the video and read on for all the details. For deep frying, you want a stockpot that will evenly distribute and retain heat, and wipe clean without sticky oil residue. 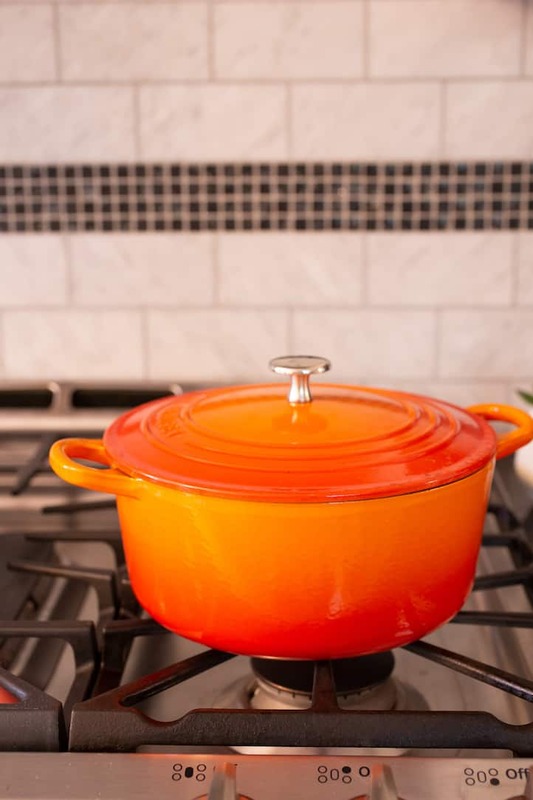 Enameled cast iron Dutch ovens, like the famous Le Creuset models, are ideal for the task, as well as regular cast iron Dutch ovens (the oil will help season them with frequent use). 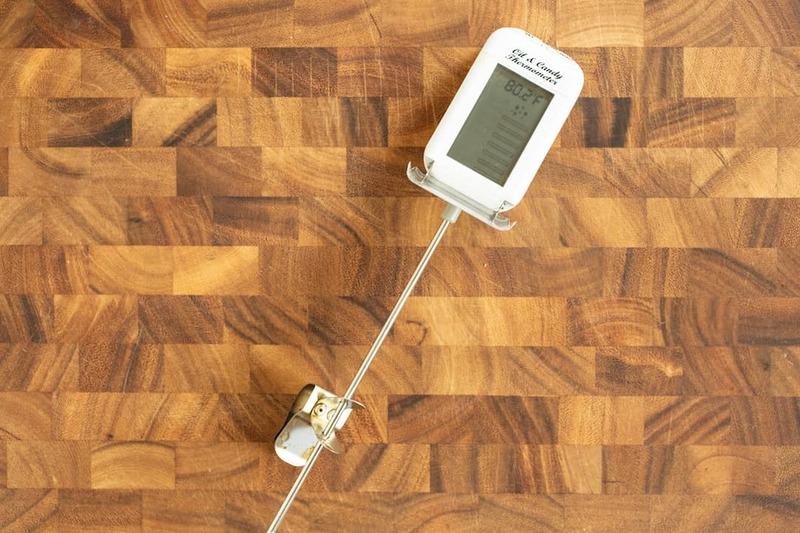 Unlike a meat thermometer, an oil/candy thermometer is designed to register higher temperatures and can be clipped to the side of a pot to stay immersed in oil or boiling sugar for long periods of time. Like an electric deep fryer, it’s a one-time investment, but on a much more affordable scale. 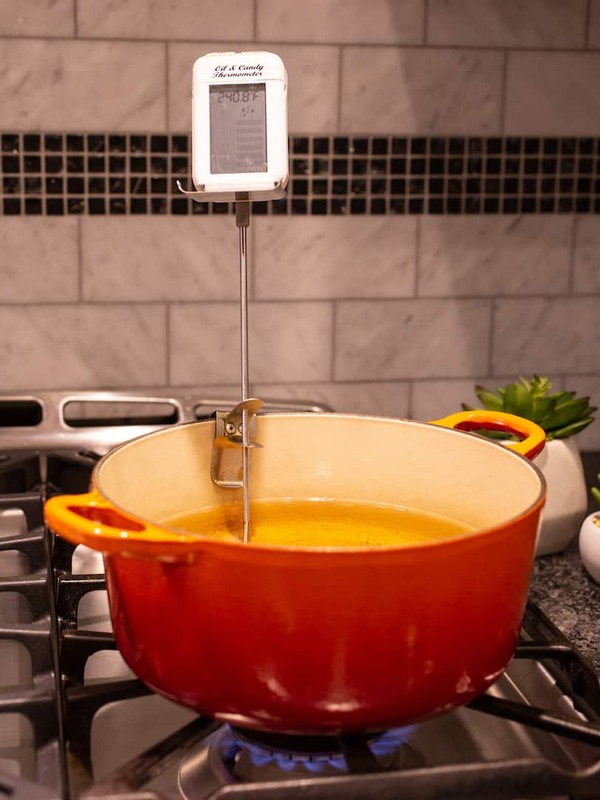 And there’s really no substitute for the safety and monitoring features an oil/candy thermometer provides. It takes so much of the guesswork out of frying or working with hot sugar and pays for itself in peace of mind. Why bother monitoring the temperature of the oil, by the way? When oil is maintained at the right temperature, it keeps whatever you’re frying from taking on too much grease or burning too quickly. Think of a thermometer as your Goldilocks insurance. If the oil is at too low of a temperature, the food will just soak it up; too high, and your breading will burn before the interior of the food cooks through. When it’s just right, the food will stay moist inside and crispy on the outside, and the oil won’t be wasted. The simplest of the three essentials, this kitchen utensil is able to simultaneously scoop up your fried goodies and drain excess oil back into the pot. Metal tongs work in a pinch, too (get it? ), but a metal spider also known as a skimmer or strainer, is wide enough to grab more than one piece of food at a time. And when you’re doing multiple batches of fried food, you want to get to the eating part as quickly as you can! Once you have your equipment on hand, you need the software—that is, you need the oil. I recommend organic canola oil or vegetable oil for everyday frying. Both of these oils have a high smoke point—that is, they won’t start to smoke and burn before they hit almost 450 degrees F.
Canola oil and vegetable oil also both have a neutral flavor that won’t interfere with the taste of your snacks. 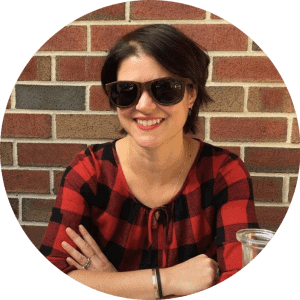 As much as I love peanut oil, it has a distinctive taste that can work against certain fried foods. For stovetop frying, be sure not to overfill your pot. Once the food hits the hot oil, it’ll bubble and sizzle, and you’ll be in a lot of trouble if the oil starts pouring over the edges of the pot like a volcano. In all my deep frying recipes, I specify oil to a depth of at least 2 inches, since that’s generally deep enough to completely submerge the food as well as shallow enough to prevent boilover. You’ll need at least 1 quart of oil for a 3 1/4-quart Dutch oven, but always make sure that the oil doesn’t fill the pot more than halfway. Once you’ve filled your pot with oil, clip an oil/candy thermometer to the side of the pot and make sure its tip is submerged. You’ll know it’s in the right position when the probe is deep enough to clear the “dimple” above the tip of the thermometer, but not so deep that it touches the bottom of the pot. 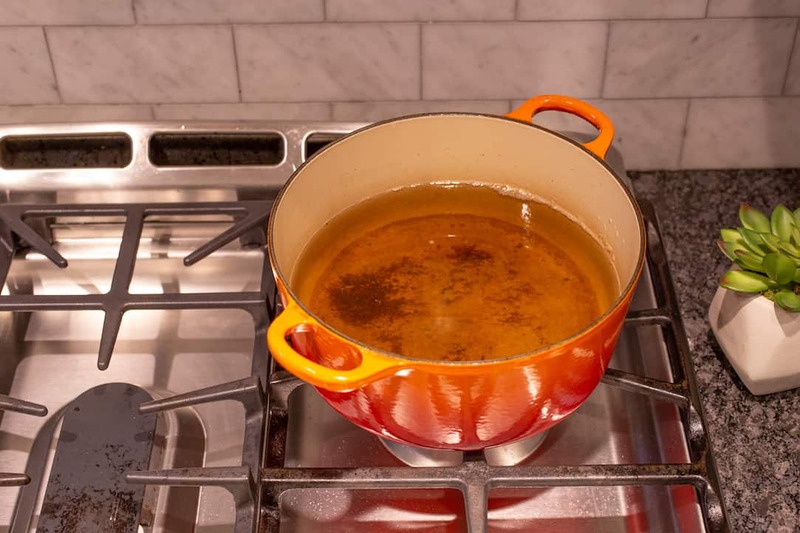 Heat the oil over medium heat to the temperature specified in your recipe: depending on the size, shape, and heat retention of your pot, this can take as little as 15 minutes or as long as 45 minutes. Whether your oil is heating in an electric fryer or on a stove burner, set up a draining station next to the frying station. I take a cue from Alton Brown and line a baking sheet with paper towels, then cover that with a wire cooling rack flipped upside-down to put the metal in direct contact with the paper towels. This helps wick away additional oil to keep fried foods crisp instead of soggy from hanging out in oil puddles. 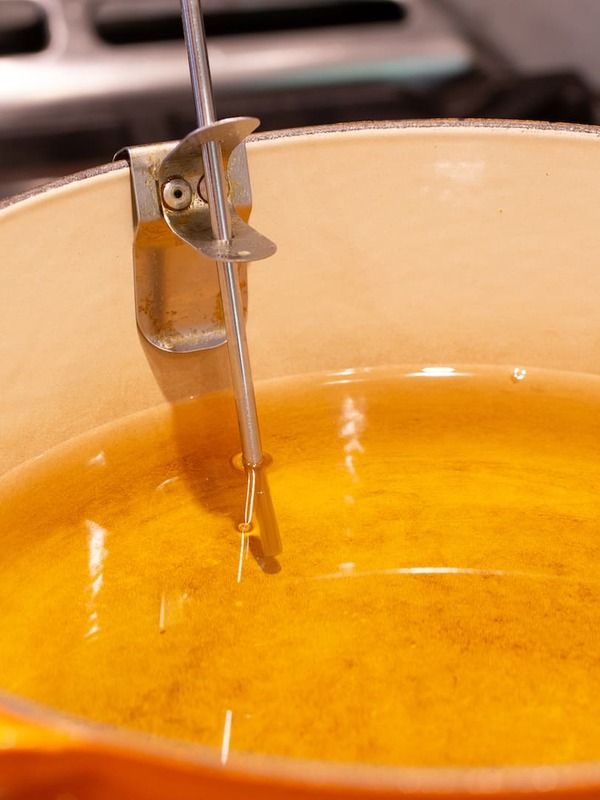 When your oil reaches temperature, carefully add your food to the pot using the metal spider. Frying is a hands-on process, so don’t walk away to catch up on Instagram or watch Red Zone. Keep an eye on what’s happening in the pot, and when your food reaches its desired brownness and crispiness, scoop the goodies out with the spider, shaking gently to let the excess oil drip off, and transfer to the draining station. Once your frying adventures are over for the day, don’t ditch the oil! If filtered and stored properly, you can re-use that oil for your next crispy expedition. First, let the oil cool to room temperature in the vessel you used for deep frying. Don’t try to decant it into anything just yet—simply move the pot off the hot burner and leave it uncovered until it cools. Once your oil is cool, place a funnel in the mouth of a clean, sealable container. 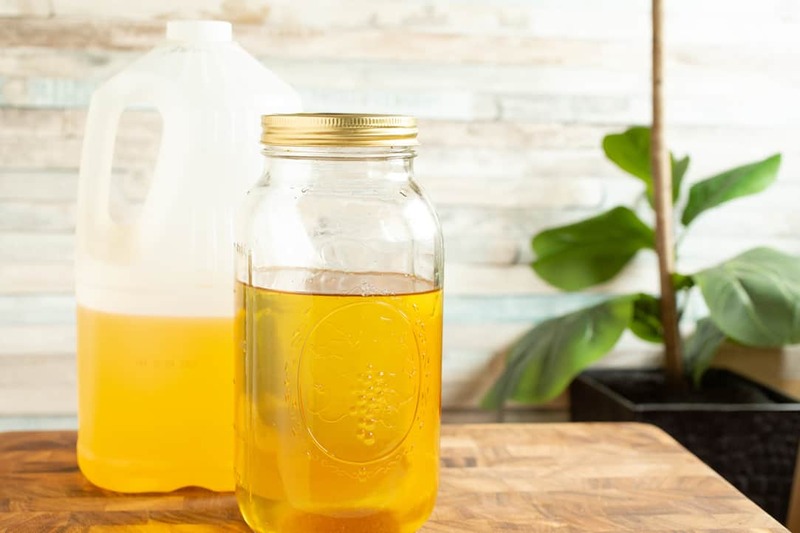 The plastic jug your oil came in is absolutely perfect, if it’s empty—if not, a Mason jar works equally well. Just make sure the container is large enough to hold all your oil. 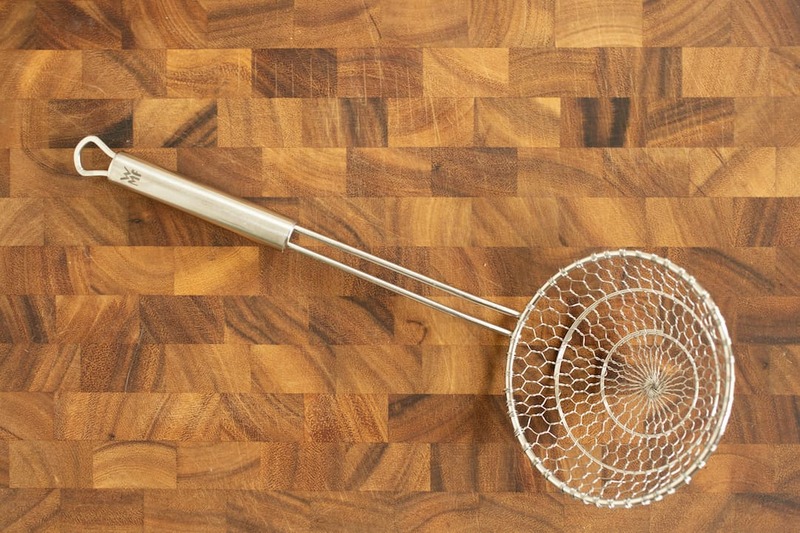 Place a fine mesh strainer or paper towel inside the mouth of the funnel to catch any errant fried bits, since they’ll make the oil go rancid more quickly. Pour the oil through the funnel into the container. Seal and reuse, filtering each time, until you notice the oil darkening significantly. 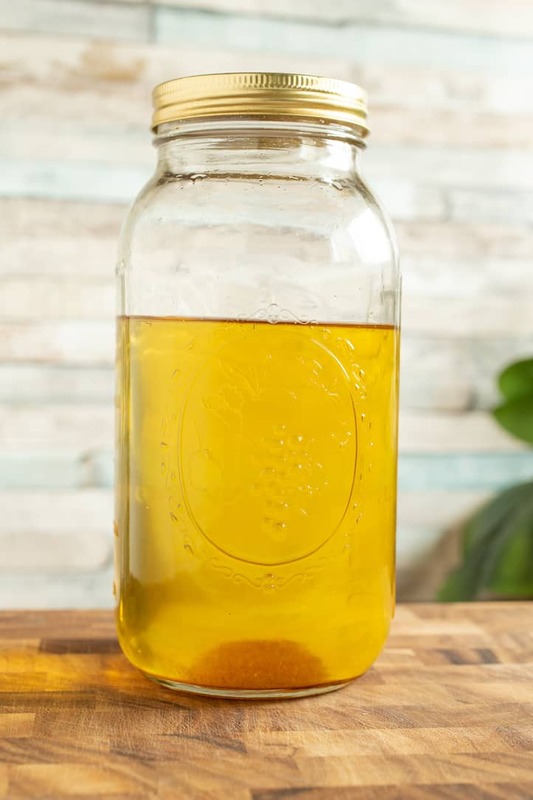 You can usually get about eight to 10 uses out of your oil before it’s kaput, but remember that frying items with a distinct smell, like seafood or salami, will flavor your oil from there on out. When the oil’s no longer usable, recycle it instead of pouring it down the drain—cooking oil clogs pipes and sewers. In New Jersey, I can take my used cooking oil to be recycled on our county’s semi-annual hazardous waste collection days. Not sure what’s allowed in your area? Call your city recycling department or department of public works, check Earth 911 for local oil recycling facilities, or talk with your favorite neighborhood restaurant about adding your oil to their recycling pickup.